This Sunday, my husband and I took advantage of the nice weather to take our little rubber boat out to the local lake to paddle around. I never know exactly how much makeup to wear on occasions like this. Certainly I need a little blush over my sunscreen. And a touch of lipgloss. But then my eyes look so tiny, that I need just a little liner and mascara to offset the blush and lipgloss. But without a little concealer, the liner will emphasize the dark circles under my eyes, so I need some of that too. (Please – you do not need to point out that I was wearing sunglasses… I could have needed to take them off. I didn’t, but I could have.) And then bronzer all over, so I look totally natural. (only better). Of course, I am sorry now that I was wearing those cheap drugstore flip-flops. But I’ve had those $5.00 shoes for more than ten years, and they are the most comfortable shoes I own, and I can totally walk in the water with them, and they float. So there you go. But I should have taken them off for this picture. My husband rowed the entire length of the lake, about half a mile, and I rowed back. I did, however, find it very easy to turn in circles. Rowing back took a very long time because I made so many circles. But I did it. I rowed all the way back. I only hit one dock. My husband is very sunburned because the trip took a little longer than we expected. He offered to take back the rowing chores several times, but NO WAY. When I am determined, just forget about it. It did remind me of my favorite movie when I was nine. I loved that movie as a kid, and I watched it many many times as a teenager and (and as an adult too, I must admit). And it wasn’t the excitement of the chariot race, or the religious miracles (although that’s what the nuns emphasized). No. It was Charlton Heston. I certainly didn’t approve of his later-life politics, but I approved in a really big way (even at nine) of his body. He was the first man I ever swooned over. But after this Sunday, I am so glad I never had to be a galley-slave. That illustration is the best! 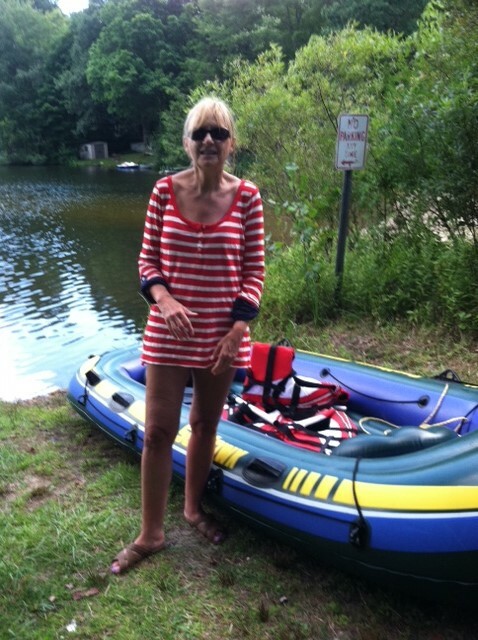 Thanks… I petered out before I got to the side of the boat where the oar goes….then I was afraid to go back and fix it… since that usually results in total ruin. For me, it’s the chariot race, hands down. But Chuck really does look good in that movie, especially when he stands in the doorway before he confronts the broken Masala after the race. He was one good-looking man. Nice to know that even men can see that. You look like a model. What are you talking about? Two separate ideas in one sentence: I can walk in the water with them. AND they float, so if I lose one, I can retrieve it. And I do work out at the gym… but I guess my left arm doesn’t know that. Do you row in the gym? Ha. Maybe that’s why your left arm didn’t want to pull join in the rowing fun. 😀 Kidding. I am thinking the $5 shoes add to your overall star quality, proving if you got it you got it. You look simply marvelous. As for rowing, I am impressed. I would have handed the oars back. I truly would have. Couldn’t give him the satisfaction. I just couldn’t. Loved this. Yoo Hoo! I have a blister! The shoes look great. You look like a rowing rockstar! How are your shoulders? 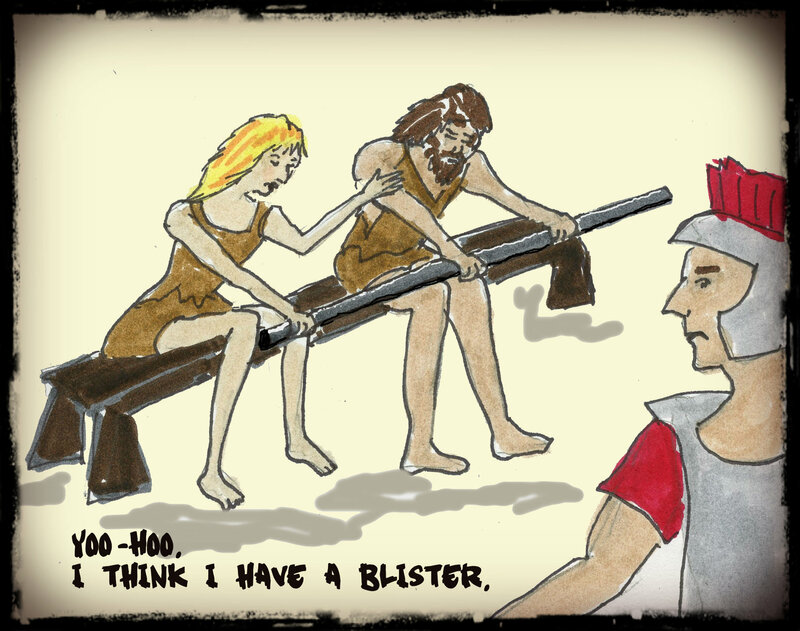 Shoulders fine – but as my cartoon portrays, I have a little blister on my left hand. I definitely DID row further… all those circles must have added a quarter of a mile at least! I haven’t been around WordPress much this summer, so I’m floored by your great news. An actual, honest-to-goodness book. Congratulations! I’m so jealous – it’s great! THANKS! I too am floored – that I actually finished it. And I like the book too – so you can’t beat that! I had the same crush — he was one of my first, in fact. But like the bad boyfriends of my youth, I know I wouldn’t have been happy with him. Politics would have divided us. At least until he shot me. Charlton Heston was the first time I ever realized that men’s bodies could be beautiful. And their brains beyond comprehension! I try never to think about their brains. It gives me nightmares. Kudos to you! I would have played the princess card long before reaching the shore. (Princesses don’t get blisters! It’s illegal!) As for Heston, I was more of a Paul Newman/Robert Redford fan. Just typing those names has my loins all heated up. Fortunately they are not sure what to do about it anymore. Oh, I have nothing against Newman or Redford either. Haha! 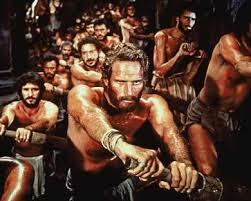 As someone who a) swooned over Charlton Heston in that galley and b) has rowed in many a circle, I love this post! I wonder if the two are connected? No…. his reaction was more of exasperation. It was a miracle that he didn’t grab the oars from me. And thanks for the nice review on Amazon! I’m not sure yet, but I may recover. just be glad you didn’t have some one yelling at you to row faster. Ha! Just let him TRY! You really have to be careful with those big lake turtles. They have been known to keep people rowing in circles for hours on end.